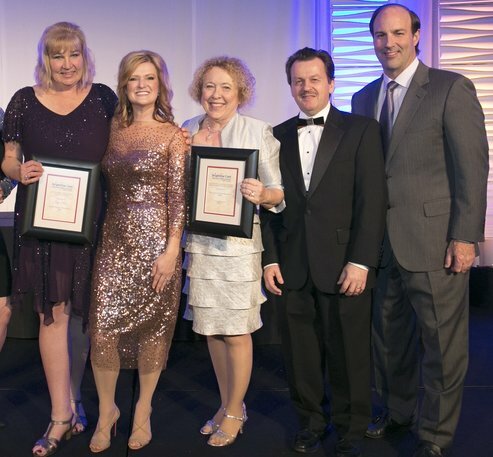 2016 Nurse of the Year Kelly Honn with BrightStar Care CEO Shelly Sun, BrightStar Care of Central DuPage/Wheaton Franchise Owners Judy and Jim Flickinger and BrightStar Care President Thom Gilday. When you ask BrightStar Care Central DuPage/Wheaton, IL Director of Nursing Kelly Honn why she went into nursing, she would say it was a calling. Kelly was recently named the 2016 Nurse of the Year award winner at BrightStar Care's annual Branch Leadership Conference in Chicago. BrightStar Care has a brand standard of having an RN oversee every case as part of delivering A Higher Standard of Home Care. Nurses are a critical part of our care teams, which is why we created the BrightStar Care Nurse of the Year program - to honor nurses from across the country not only for their hard work and expertise but also their truly unique desire to make a difference. "They are often the voice for those who cannot speak," said BrightStar Care Chief Clinical Quality Officer Sharon Roth Maguire. "They will stand up for what is right in the face of great adversity often at their own personal or professional consequence. They take their regulations and practice acts very seriously to ensure the right thing is done and all patients receive the care they deserve and that the businesses they are involved in do not suffer the consequences of a bad decision." nominated but she was also a national finalist representing the Midwest region at BrightStar Care's Branch Leadership Conference. One of the most outstanding qualities that Kelly possesses is her ability to develop strong relationships with her clients, extending her loving care to become an unofficial family member. Kelly is a treasured nurse in her local agency, the BrightStar Care system and the nursing profession, congratulations on this wonderful accomplishment! Read more about Kelly and the other 2016 Nurse of the Year regional finalists. Or, if you have questions about home care, request a call or find a BrightStar Care location near you.